March is one of the trickiest times of the year at the farm. There is still snow on the ground but Spring is flirting with us and we’ve had a few warm days with highs in the 60’s. It’s been lovely to feel the warm sunshine on our extra pale skin after a long and dark winter. The greenhouses are filling up with starts and our days are slowly starting to transition from winter hibernation mode to the spring hassle. 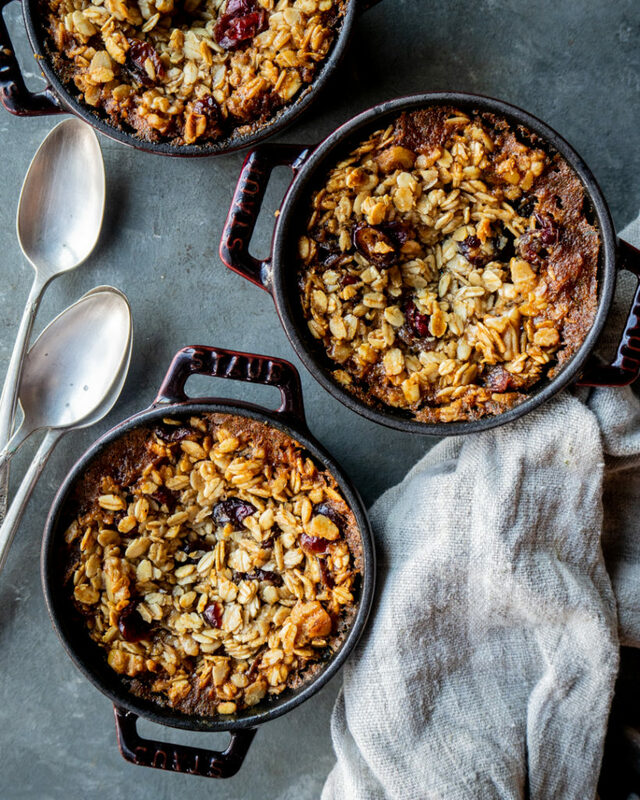 Fueling up for a long is essential this time of the year and these little ramekins of baked oatmeal are a wonderful and tasty way to start the day. I hope you all enjoy this breakfast as much as we do. Pour a cup of coffee and dig in. In a small dry skillet toast the walnuts over medium heat until lightly browned and fragrant. Remove from the heat and when cool enough to handle chop them. In a medium mixing bowl, combine the oats, toasted nuts, cinnamon, nutmeg, baking powder and salt. Whisk to combine. In a smaller mixing bowl, combine the milk, honey, egg, half of the butter and vanilla. Whisk until blended. Add the wet mixture to the dry mixture and toss in the cranberries. Mix well. Scoop the batter into individual ramekins or a greased 9 inch baking dish. Bake for 35-40 minutes, until the top is nice and golden. Remove your baked oatmeal from the oven and let it cool for a few minutes. Drizzle the remaining melted butter on the top before serving. This oatmeal also reheats really well so you can serve it all week long! This is mouth-watering. I will try this soon and comment here and let you know how it turned out to be. MAybe even leave a phto. Looks amazing Andrea! Thanks for sharing. Do you think it would reheat well? I’m always looking for yummy breakfast options to meal prep for busy weeks. And is it supposed to come out crispy or soft? stir them in with the dry ingredients. This looks amazing! I love a good spiced oatmeal. Can you substitute oat milk for the whole milk?